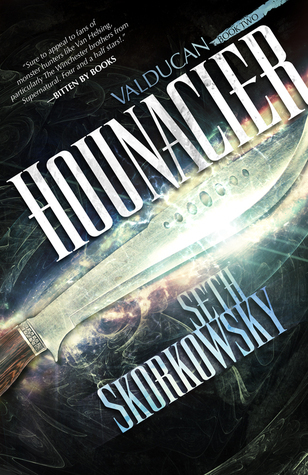 Our friend Michael is reviewing Hounacier (2nd installment of the Valducan series) by Seth Skorkowsky. We hope you enjoy his excellent review. One thing I really love about this series is that each book is essentially a stand-alone, so you can really start anywhere. While they are stand-alones, they do build upon one another. So you will miss out on some context for past missions and info on past characters, but you’ll still find enjoyment even if you start here. Hounacier, like Damoren, is a blessed holy weapon and is wielded by Senior Valducan Knight Malcolm Romero. I found this interesting because Malcolm was a character that I didn’t really like much in Damoren (gotta read and find out why). That piqued my interest all by itself. We get a really cool intro explaining how Malcolm came to meet Hounacier and, at the same time, got a great set-up for the setting and feel of the book. While Damoren took us to quite a few locations and cities/countries, Hounacier takes places exclusively in New Orleans. Now, I’m not really all that interested in New Orleans or voodoo (which is the chosen religion/magic system for this book), but Skorkowsky did an amazing job at getting me interested in both of those things. Our monsters were also a bit less varied than in Damoren, but that didn’t take away from the story at all. While Damoren felt like a hodgepodge of monsters (I don’t mean that in a negative way) Hounacier focused mainly on ghouls, asanbosam, werewolves, and a succubus. Hounacier is, essentially, a murder mystery. And a love story of sorts (but not exactly how you’re thinking). Malcolm has just completed one mission when he checks his email, for once, and finds a couple emails from his mentor, Ulises, and one from one of his old friends stating that Ulises has been murdered. He goes back home, to New Orleans, to find out what has happened so he can revenge his mentor. In the midst of his investigation he finds himself betrayed and has his holy blade, Hounacier, stolen from him. Here’s where reading Damoren pays off. His only hope to saving his soul and getting back his beloved holy weapon is to rely on someone he doesn’t really like: Matt aka the wielder of Damoren. Matt has actually been sent to kill Malcolm, for reasons I can’t say, which is quite the conundrum for Malcolm because he wasn’t exactly very welcoming to Matt when he showed up as their new recruit, back in the events of Damoren. One of the things I loved most about this book, is it gives us a look into someone who was quite the douche to Matt in Damoren. I actually really disliked Malcolm in the first book but came to love him quite quickly in Hounacier. I love getting into the head of characters I dislike. That’s one of my favorite parts of reading; I think it’s a great teacher of empathy. Malcolm actually gets some really great development here. Which is nice for a character who was pretty hard-headed in the previous book. The pacing was, yet again, so great!! It was fast when it needed to be, but also slowed down, when we needed it to. Skorkowsky excels at writing suspenseful scenes. Due to the body count in Damoren and a certain event, about halfway through this book, no one really feels safe. There were times that I just breezed through this book due to the suspense. It’s a fairly easy read, as evident by being able to finish this the same day that I started it. I just couldn’t put it down! This book also challenges just about everything the Valducan thought they knew about monsters and their victims. Which was a very nice touch. This one may appeal to some fantasy fans a bit more due to the main character wielding a machete instead of a gun. I know a lot of people find guns in fantasy lame (don’t personally know why as I love when guns are incorporated well; which Damoren is definitely incorporated very well), so this may be a huge bonus for many people. All-in-all, I can’t recommend this series highly enough or do it the justice it deserves with a measly review. This has just about everything that I think makes a story a great story: wonderful magic system, great characters, fast paced plot, amazing lore, and a fun setting.